Nelson the Noun is exhausted by his job naming people, places, things, and ideas, so he takes a break, leaving the Noun Office in the hands of Roger the pronoun. Once on vacation, however, Nelson realizes that even a beautiful island is no fun without the other parts of speech. 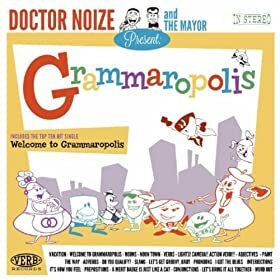 He returns to Grammaropolis... just in time to fix the chaos Roger has caused in his absence! Includes four pages of awesome grammar exercises. Vinny the action verb and Lucy the linking verb approach life differently; Vinny's all action, but Lucy prefers to sit back and be. With their friend Jake the adjective in trouble, however, the two verbs must put aside their differences and work together to save the day... and become superheroes! Includes four pages of awesome grammar exercises. Check back soon for the rest of the books in the Meet the Parts of Speech series! A full-length music album with songs for every part of speech (including Slang! ), performed by the award-winning children's musician Doctor Noize. Visit "Noun Town" or catch the mini-musical "Lights! Camera!! Action Verb!!!" Enjoy different genres for every song, from the Adjective's springlike melody to the electronica of the Interjection, all the way to the conjunction's gospel-inspired anthem, "Let's Bring It All Together." Featuring all nine of the Grammaropolis music videos in addition to the twenty animated shorts. A messenger bag tells people you like to carry things. 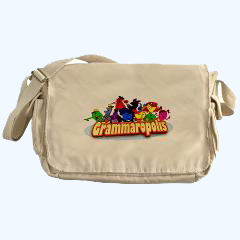 A Grammaropolis messenger bag tells people you are smart and awesome and like to carry things. 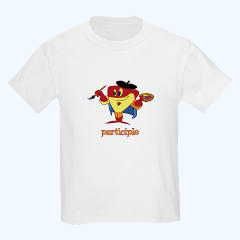 A participle is a verb acting as an adjective. Here's proof! 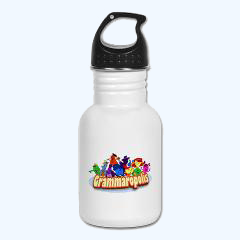 Children love to be hydrated almost as much as they love grammar. Two birds, meet stone.